Things move fast in the kitchen. It’s easy to reach out and grab the wrong thing when cooking up a storm. Of course, this includes hot cookware, but there is another threat lurking when the cooking is fast and furious: The Mess. Having a hand towel nearby while cooking is essential. Having one that also does duty as pot holder is twice as nice. The Campanelli Cooking Buddy (available in three different colors) is an over-the-shoulder cooking accessory that looks to keep the cooking action smooth. 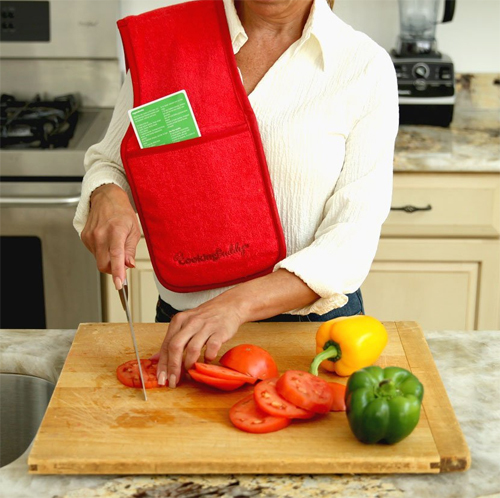 Touted as being a “Professional Grade All-In-One Pot Holder, Hand Towel, Lid Grip, Tool Caddy, and Trivet,” the convenient accessory also makes for some dashing garb when tossed oh-so-fashionably over the shoulder. That is until, the food goop on the other side ends up on the shoulder. Oh well, I guess that’s why they don’t include “fashion accessory” in the description. 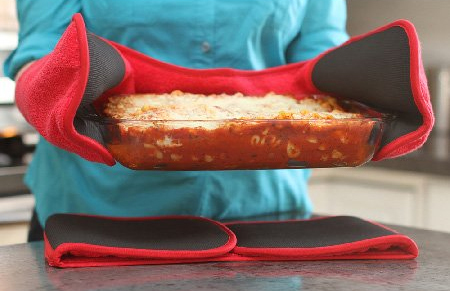 Still, who cares when a piping hot lasagna in heading your way? Mmm.